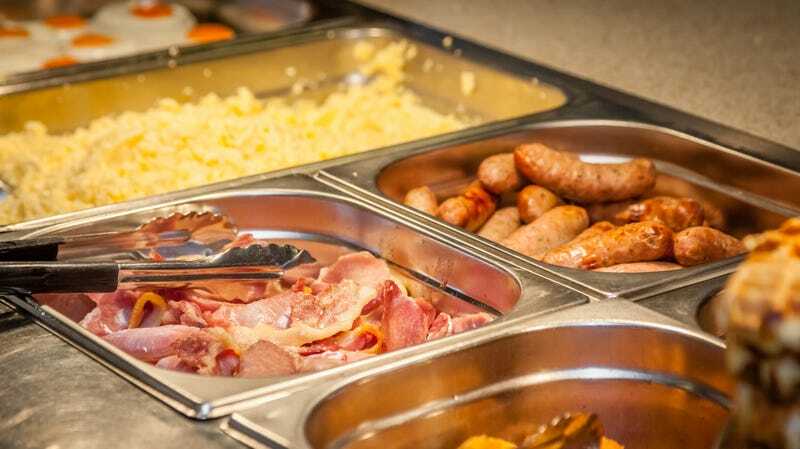 What constitutes “stealing” from a breakfast buffet? Ah, the breakfast buffet. Upside: Unlimited breakfast meats. Downside: Lotsa melon and possibly suspect eggs that have been sitting out there for lord only knows how long. Still, the weary traveler or overworked business person undoubtedly is cheered by the large silver chaffing dishes of pancakes and waffles, hastily devouring a probably larger-than-usual breakfast to take advantage of the limitless eats. But then, the question emerges. How much is too much? For example, can a person snag a muffin for later? What if I’m on the road with my kids at a Hardee’s and take some of that buffet for a later-in-the-day snack? Where is the breakfast buffet line (besides the one that consists of hoards of people clamoring to get to the sausage links first)? This is seems like a bit much to us, even though The Guardian saluted this effort, referring to “ruining an entire hotel’s profit margin thanks to an unearned sense of greedy spite” as “hero’s work.” We’re still not sure, though, so we contacted hospitality professor Michael McCall, director of the School Of Hospitality Business at the Eli Broad College Of Business at Michigan State University. The difference, he points out, is when the staff offers food to take with you versus you pulling out your own plastic containers and just taking food by yourself. To McCall, to “create your own doggy bag is, in my mind, equivalent to theft. You have agreed to eat a meal, not feed yourself for a week.” So if you want that extra muffin for a mid-morning snack later, who could blame you? Just ask the server first.